Born in London, Edward Henry Fahey developed an early interest in art through his father, the painter James Fahey, a founder member of the New Society of Painters in Water Colours (later the Institute of Painters in Water Colours). While studying architecture at the National Art Training School in South Kensington, Fahey also worked as an illustrator for The Graphic and The Illustrated London News . 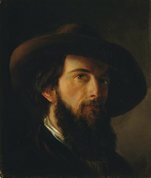 After a three-year visit to Italy in 1866, he turned to painting full time, and enrolled at the Royal Academy Schools. He was a regular exhibitor at the Royal Academy, becoming a member in 1875, and at the Society of British Artists (Suffolk Street). 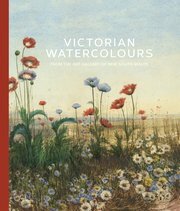 He was elected to the Institute of Painters in Water Colours as an associate in 1870 and a full member in 1876. Mr Edward Fahey’s artistic studies of landscape in subdued tones again arrest attention, not so much by their technical qualities, perhaps, as owing to a certain sentiment which the painter so well understands how to infuse into his work. Fahey was closely associated with the clique of young progressive artists who exhibited watercolours at the Dudley Gallery during the late 1860s and 1870s. Taking their lead from Walter Crane and Robert Bateman, the members of the group were loosely linked to the Aesthetic Movement, and were dubbed the ‘poetry-without-grammar school’ by The Westminster Review in 1869, ‘delightful for sentiment, but ridiculous for drawing’, as the critic lamented.